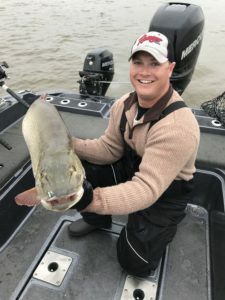 Musky fishing is one of my greatest passions. When I can’t go fishing for muskies, I’m thinking about it or talking about it. 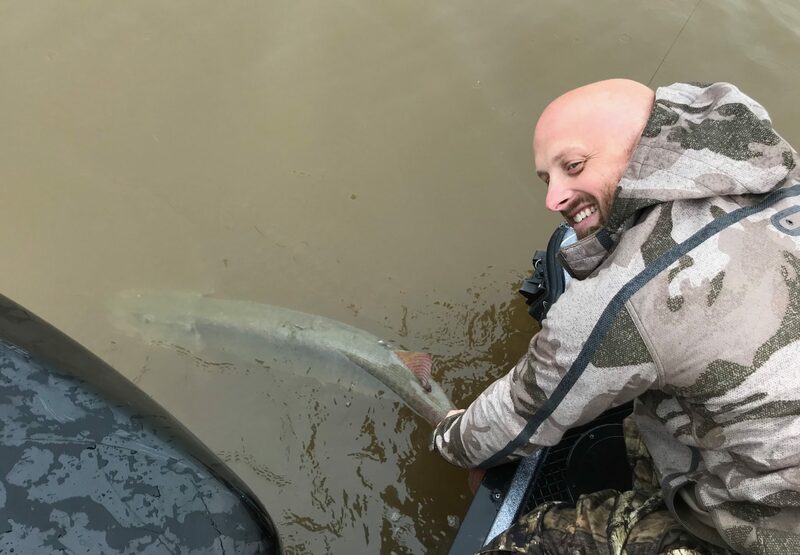 Any certified musky nut will tell you, one of the greatest feelings in the sport is helping someone get their first musky. This feeling can be multiplied exponentially when the first musky is caught by a young angler. Running a trip on the morning of October 14th, I had a chance to do just that. I was excited to meet clients Ben and Owen that morning. I knew Owen, age 12, had not musky fished before. When Owen’s uncle had contacted us to book the trip, he told us Owen had called him and said he “Wanted to catch big fish.”. The day before had been very cold and windy. This day, however was flat calm. I met Ben and Owen at the boat launch and we got out on the water. Sometimes musky fishing can be slow and Ben and Owen were booked for a four hour trip. For that reason, I was happy when the first rod went off about an hour into our trip. 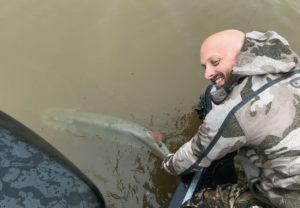 Owen reeled in a 28″ pike and we were on the board! Ben and I shared a sigh of relief when the fish hit the bag. It wasn’t long after that another rod went off and Owen had his first musky in the bag! There were smiles all around the boat and Owen and I had a “slimy high five”. After a few quick pictures, the fish was released and we were back to fishing. We fished for less than an hour longer and we were hooked up again! This fish, apparently, had swiped at the bait, missed, and apparently came back after it again. The fish got foul hooked near the top of the head, making it much harder to reel in. Ben and Owen worked together to bring the fish in. 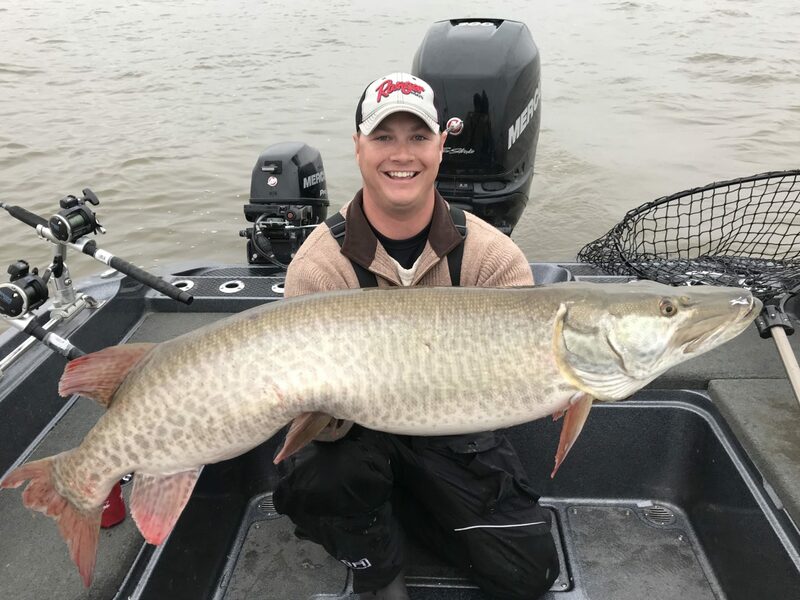 The second musky measured 42″. 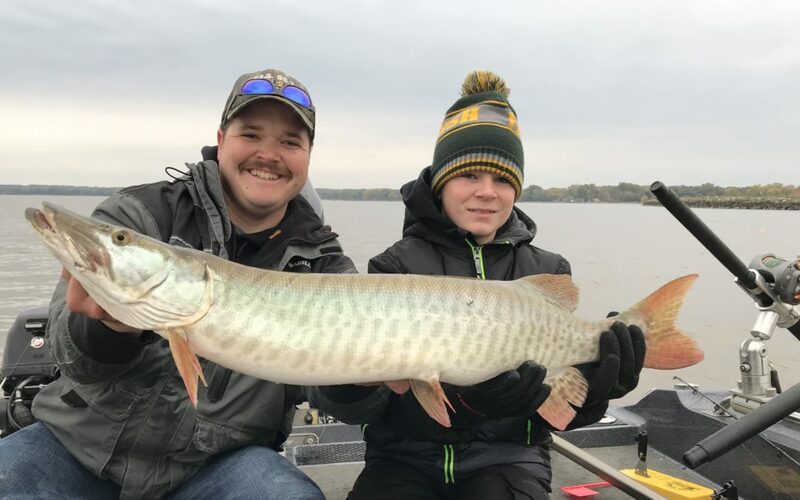 Some people fish for many years without catching a musky and Owen caught two in just a four hour trip. Owen’s second musky, caught with the assistance of his Uncle Ben, pictured. The only thing better than catching these fish is watching them swim away. Later that day, I had another group scheduled, but they had to cancel their trip. For that reason, I fished with friends Jamie Degroot and Alex Halbrook in the afternoon. We had a fish on in the early afternoon that was almost to the net when it got off. Later that afternoon, the same rod that Owen had caught his two fish on went off again. 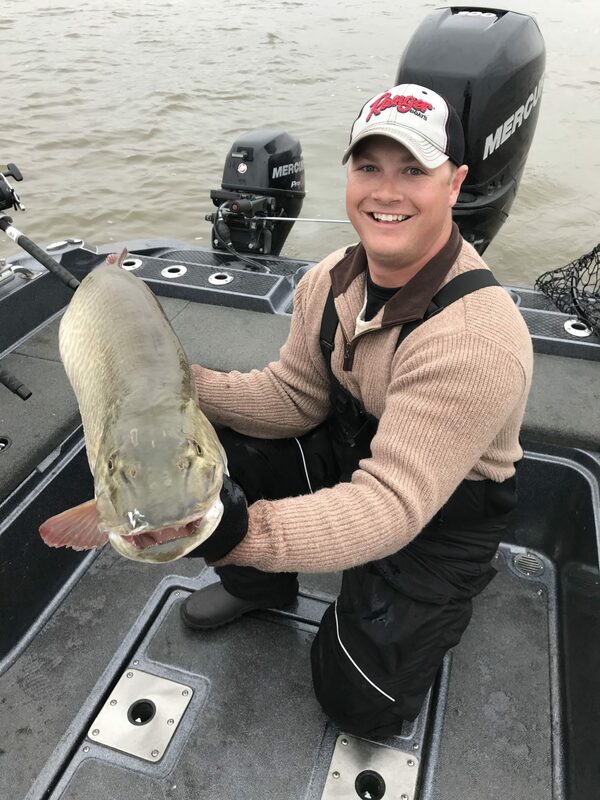 Alex reeled in what would turn out to be his biggest musky caught on the bay, a 50 x 24″ beast. 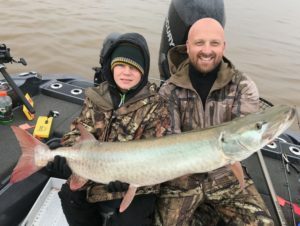 Alex is a fellow musky nut who has caught a lot of big fish, but this was the first time he landed a 50 on Green Bay waters. The pictures below show how happy he was, and the true magnitude of this monster. Look at those smiles. This beast of a fish was not missing any meals!